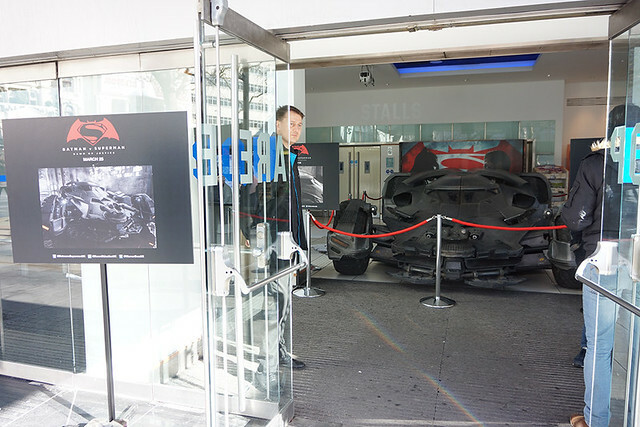 A couple of weeks ago I received a Bat alert in my inbox that the Batmobile from Zack Snyder's Batman v Superman: Dawn of Justice had just arrived at the Odeon Leicester Square and could be viewed. I should mention that for guys my age that grew up having their comic book world broadened by Frank Miller's dark interpretation of the Batman with his The Dark Knight Returns. The tale of an older Bruce Wayne - hard boiled by years of crime fighting and having his world implode in on itself as it slides further into dystopia. That is until The Batman we know uncomfortably shifts from vigilante to revolutionary activist as his chosen path turns him against the world and - makes him the most dangerous man alive as he almost single handedly rages against the machine, the tide and the dying of light. His the end justifies the means and he becomes maybe not the hero the future world wanted but the one it needed. This has become de rigueur in our culture - but back then it was like nothing before, well certainly in the mainstream comic world. It changed everything - suddenly the the future our heroes have been fighting for in every comic ever written was stolen. Miller proposed that the future we all believed in does not pan out and is rather just a part of a slow slide into further dystopia and our heroes have to evolve or adapt to survive in this new world. 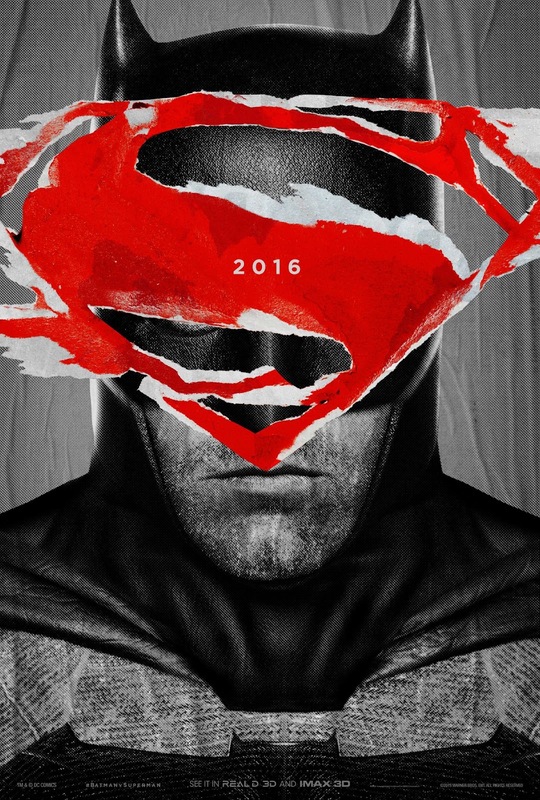 And whilst Zack Snyder' seems to have turned the whole thing on its head with Batman v Superman: Dawn of Justice promising to be the start or dawn of something great, rather than the swansong of The Dark Knight - it may be the film I have been waiting 30 years for. Of course I didn't read the entire email as I was out the door and on my way to Leicester Square after reading the subject line “Batman v Superman: Dawn of Justice - Batmobile at the Odeon Leicester Square”. I arrived at the Odeon a lot earlier than was expected as they were still setting up the promotional kit to accompany the car as can be evidenced in some of the photos below. 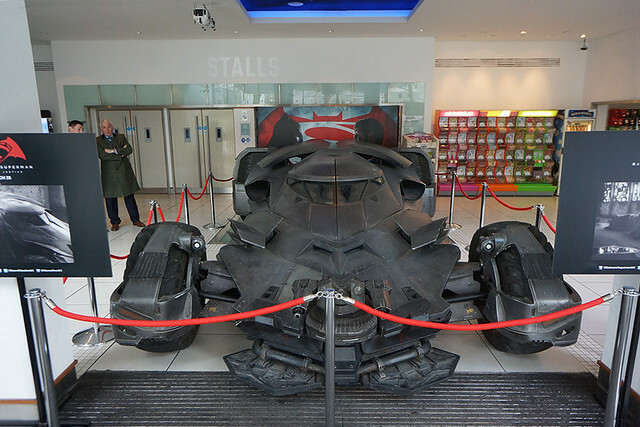 Visitors to London’s Leicester Square this weekend will come face-to-face with the real Batmobile from BATMAN v SUPERMAN: DAWN OF JUSTICE. Ahead of the film’s release on 25th March, Warner Bros. Pictures UK will be showcasing the incredible automotive machine at the Odeon Leicester Square on from Friday 19th to Sunday 21st February. 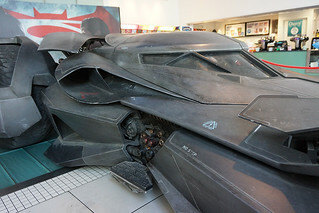 Measuring 21ft long by 11ft wide and boasting a 50mm Twin Rotating front cannon, the 3500kg the Batmobile will be an awesome presence, with both cinemagoers and passers-by getting the opportunity to take photographs thanks to the Odeon’s glass-fronted lobby. 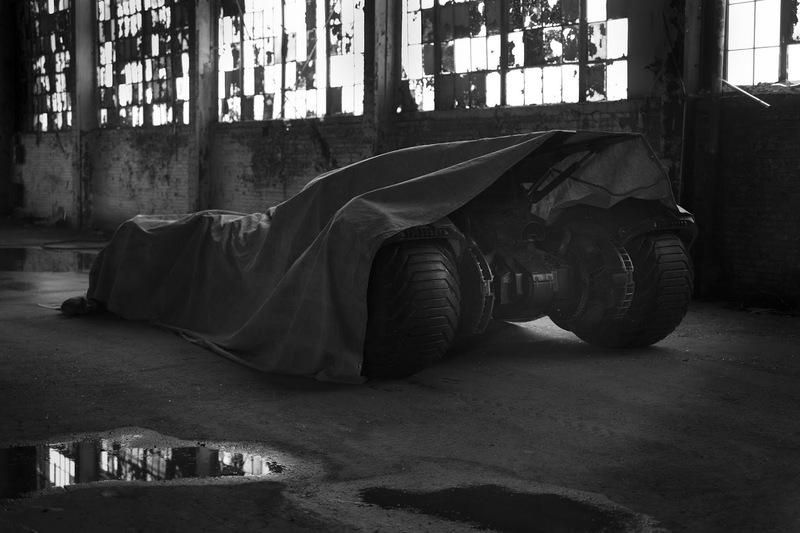 As I am sure you are aware Zack Snyder teased the first look at the Batmobile on his Twitter feed with a half exposed Batmobile under a tarpaulin sheet back in May 2014. 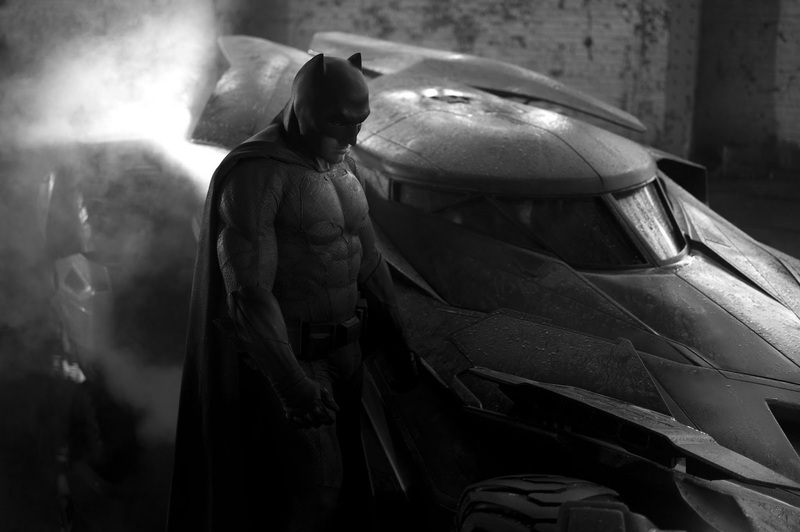 The next day Snyder revealed a little more of the Batmobile and the the first look at Ben Affleck as The Dark Knight. The design of which seemed to be a big nod to Tim Burton & Anton Furst's Batmobile for his Burton's 1989 Batman. Making us wait a full four months before giving us a proper look at the Batman v Superman: Dawn of Justice Batmobile in September 2014. 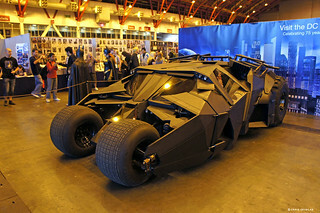 Which brings me to Friday 19th Feb when I got to see the Batmobile up close for myself. Wow! She is a thing of beauty in real life, seemingly a combination of rugged utilitarian muscle power and futurist concept space ship design. The more I looked the more it began to look like some sort of flying ship than a car. A Fearing the actions of Superman are left unchecked, Batman takes on Superman, while the world wrestles with what kind of a hero it really needs. With Batman and Superman fighting each other, a new threat, Doomsday, is created by Lex Luthor. It's up to Superman and Batman to set aside their differences along with Wonder Woman to stop Lex Luthor and Doomsday from destroying Metropolis. The first thing that struck me was the low slung wedge shape - a popular design for sports cars as the streamlined shape produces less air resistance making them faster and more fuel efficient. 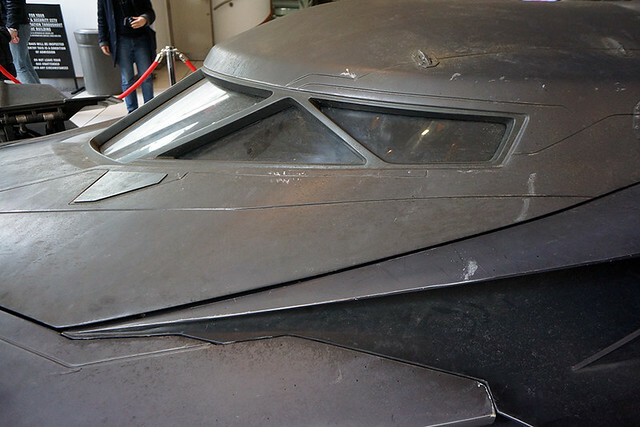 This shape was prevalent in many early Batmobile designs including the compact version for Christopher Nolan's The Dark Knight's Tumbler. The high kicked up tail, larger rear sloping down to the ground hugging nose hints at a large engine in the back as confirmed by the single jet or afterburner exhaust under the wings. Its overall exterior design seems to be borrowing from the angular design of anti radar military stealth technology. And with the large shaved tractor rear tyres and what seems to be independent front system controlling the smaller front Alliance tractor tyres it seems to be a high powered and agile all terrain vehicle. Something like a hybrid between an urbanised Hummer and an ATV or off road racing vehicle. 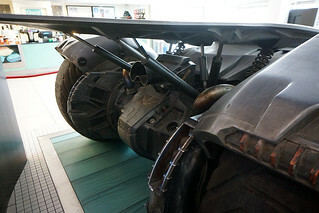 It also seems that, in a similar way to George Lucas' pioneering technique of the "dirty and used" look making the Millennium Falcon seem more credible and placing it in the real – Snyder adopted the same technique to make Batman's Batmobile unique alien design seem more real. It's dirty and a little battle worn. Previously Christopher Nolan and Nathan Crowley's design for the Dark Knight Trilogy Tumbler followed a fairly similar approach but with an overtly military feel to it. In the films it is re purposed military tech so it makes complete sense, as it would take years for a young Bruce Wayne to create and refine a suitable vehicle - this is not a constraint for Ben Affleck's veteran Batman. Rather than the sweeping lines that extended from the iconic 1966 Lincoln Futura Batmobile design by George Barris and popularised by the early Batman films Zack Snyder's design seems more military, more compact and more functional. Thankfully Snyder's Batmobile design progresses on from the Tumbler and is far removed from the previous Batmobiles, which revelled in surreal novelty but forsaking the practicalness of crime fighting in urban environments. 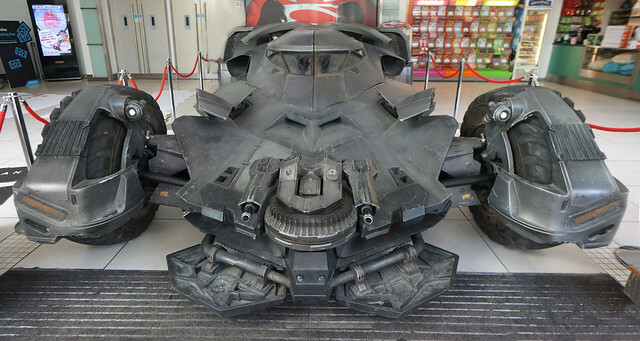 Both the Tumbler and Snyder's Batmobile draw heavily on Frank Miller's tank like Batmobile from Batman: The Dark Knight Returns – which also seems to draw as much inspiration from Tim Burton's Batmobile for Bruce Wayne's Batmobile in Batman v Superman, including the tone, look and feel. Something I already love about the new Batmobile design is that the gravitas Zack Snyder is laying down as he said that his Batmobile is built by Bruce Wayne and has been adapted over time according to need. 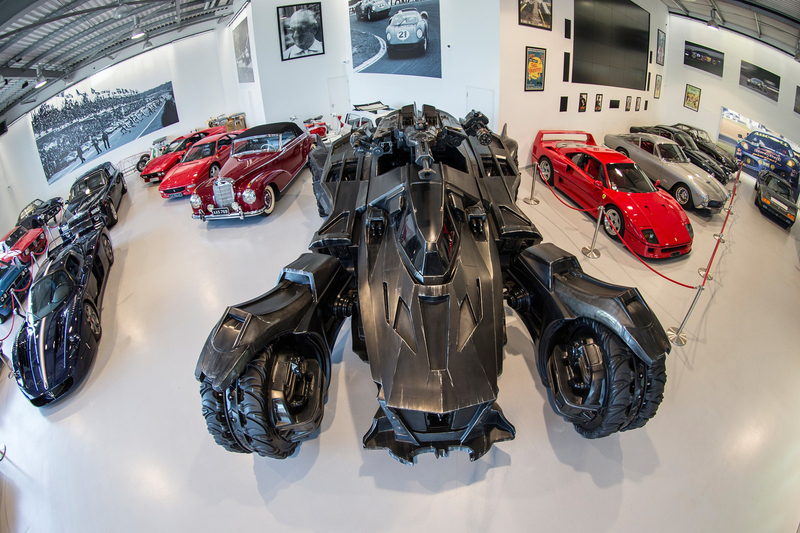 Even further back, last June to be precise at the Licensing Expo 2015 in Las Vegas, Warner Bros. unveiled the Batmobile to the public for the first time as well as the new Batman and Wonder Woman's costumes alongside Superman. They even rolled out some promotional imagery from David Ayer's The Suicide Squad was also on display. Single-handedly designed and fabricated in near complete seclusion by The Batman, this infamous pursuit and capture vehicle has earned its reputation as the apex predator on the mean streets of Gotham City. Over powered with an unmatched hybrid of prototype military and civilian performance technologies, this top machine has been estimated to reach speeds of up to 205 MPH. The Batmobile’s imposing defense capabilities, supported by stolen Wayne Industries technologies, have been integrated with the latest in covert military grade armaments, stealth and active protection systems. 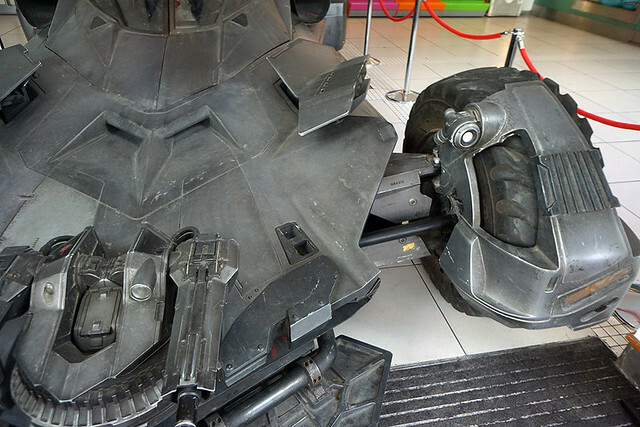 So surprisingly Snyder's Batmobile is larger, heavier and faster. However as the Tumbler was originally a military bridging prototype vehicle and could actually do the jumps you see on screen. The size and weight must have been refined and reduced as Chris Corbould, Andrew Smith and their team got the practical jumping effect right. If you are curious about the design of the Tumbler and somewhat the new Batmobile that includes the dual extended front tire mechanics of the car - as well as enhanced practical functionality such as traction and suspension - the design is supposed to be reminiscent of - a bat. So those would be the upper part of the wings if you were to look at the vehicle from above. As demonstrated by our friend below. - a front mounted twin .50 calibre retractable machine gun turret, ATV like independent front wheel suspension (you just know this car is going everywhere), floating tyre hugging fenders, a laser system possibly for targeting the machine guns or missiles, as well as two low hanging armour panels at the very front of the car that look like the fold up to act as a battering ram/cover the front air intake or act as bullet /concussion proofing. As there are no distinguishable traditional style headlights I guess the small lights on top of the wheel fenders must be high power LED lights. 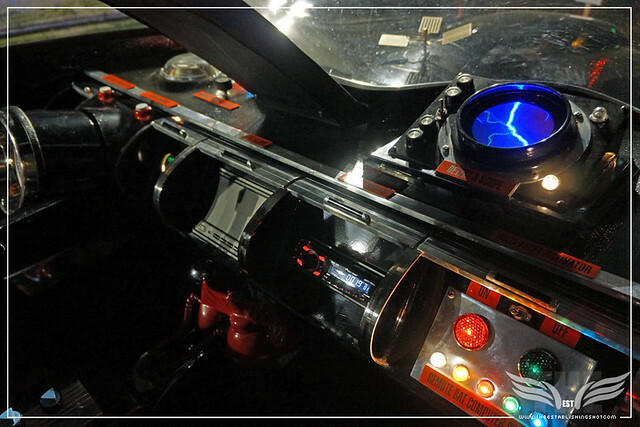 Very much in the motif that was implemented with George Barris' 1066 Batmobile the cockpit was full of buttons and switches controlling Bat functionality. Enlarging my pictures taken through the very dirty windows of the badly lit cockpit from a slight distance (they did promise to open the doors later in the day, but I could not make it back). I could see that the panels and consoles where all built around the right wheel drive seat. And then another surprise - the second seat seemed to be closest to another joystick like controller! Possibly a targeting control for missiles or the turret. But Holy Sidekick! The surprising thing here is that the proximity of the second seat to the joystick seems to indicate that - it is meant for a second person to control the system! 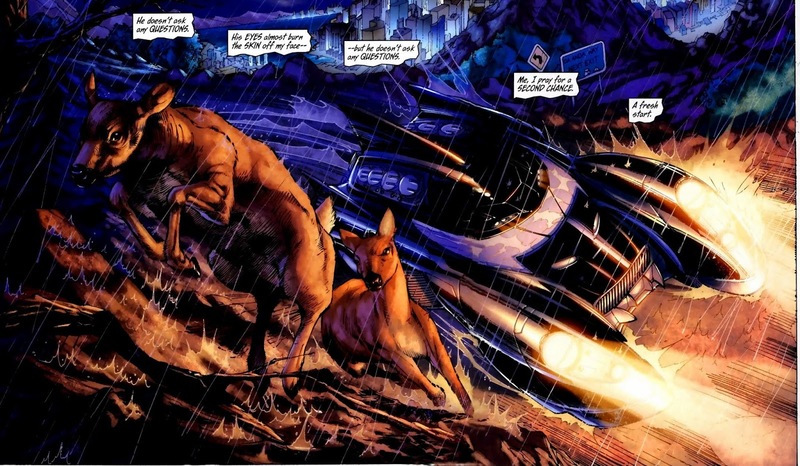 Greg Capullo's 2011 Batmobile for Batman: Zero Year - Batman #25, Lee Bermejo's 2011 Batmobile from Batman: Noël, Grant Morrison & David Finch's 2011 Tumbler inspired Batmobile from the one shot Batman: The Return, Paolo Rivera's 2013 Batmobile from Batman Black & White #5, Chris Cross' 2013 Batmobile from Smallville Season 11. Thanks to the brilliant guys behind the best visual guide to the Batmobiles currently on the internet: Batmobile History. 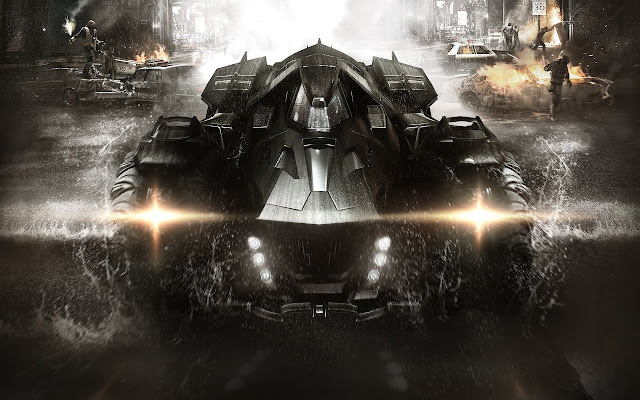 and the most noticeable influence on the Batman v Superman: Dawn of Justice Batmobile seems to be the Combat Mode Batmobile from Rocksteady Studios Batmobile from Batman: Arkham Knight - which it seems to share many design elements and functionality with. Back in July I highlighted that there were many similar elements in Snyder's film and Batman: Arkham Knight. 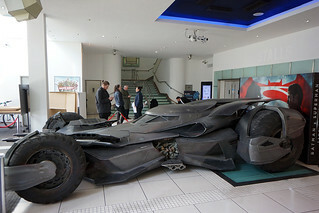 Photo from Warner Bros's Batman Arkham Knight Batmobile housed at Joe Macari Supercar showroom in London (ZOOM) Photo Copyright Warner Bros. It is currently housed in the famed , but is not for sale and a complete one of a kind. Instead of the long, sweeping lines of other animated Batmobiles, this car is a very compact, powerful looking machine. 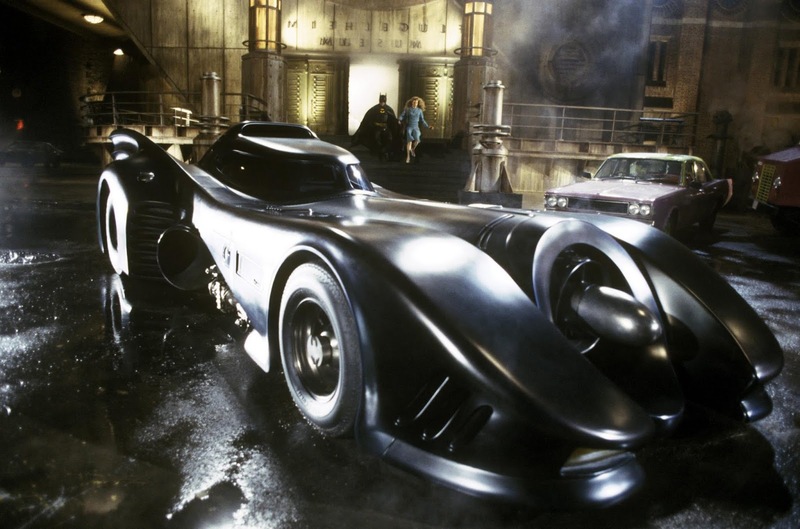 Traditional Batmobile design cues are still present, however: the rear fenders include a pair of long fins, the tail of the car is designed around a series of jet exhausts, and the side coves bring to mind the design of the 1989 Batmobile. 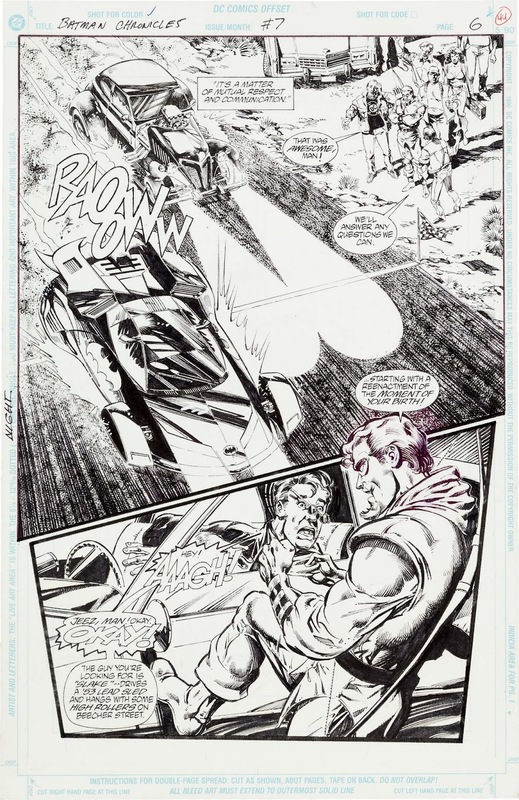 Like the Batman: The Animated Series Batmobile, the car uses a distinct internal-combustion sound effect, even when the jets are fully engaged. 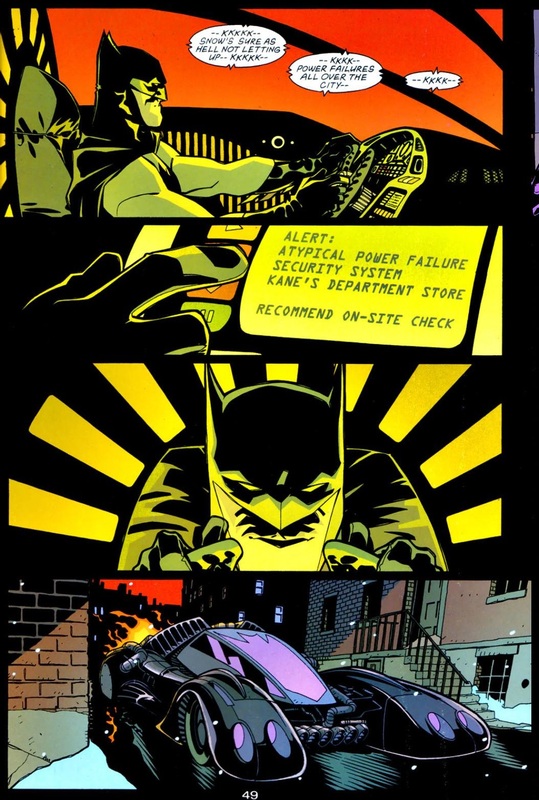 To aid in keeping Batman's true identity a secret, it was built with fully custom parts (including the tires) so as not to leave evidence that could be traced by police. Special features include a remote homing device and automatic driving feature, though its remote brakes occasionally needed a bit of tweaking. It is an extremely rugged car, and has shrugged off damage that would disable or destroy regular cars. It was damaged substantially in the movie Batman vs. Dracula, though not enough to put it out of commission permanently. It also looks like there are lots of shifting panels and pop ups which will allow the shape and functionality of the new Batmobile to possibly transform as it shifts between different modes. 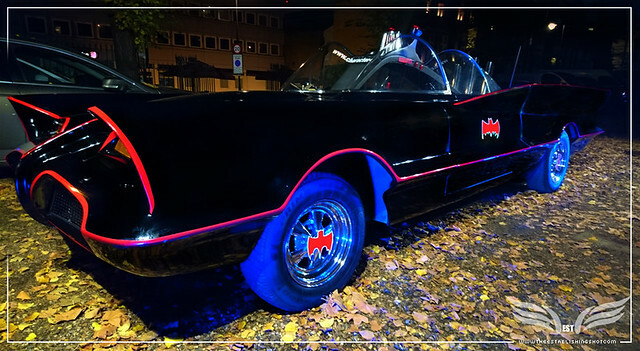 Like Cruising or Battle or rather pursuit and combat mode like the Batmobile from Rocksteady Steady's Batmobile from their 2015 Batman: Arkham Knight console game. 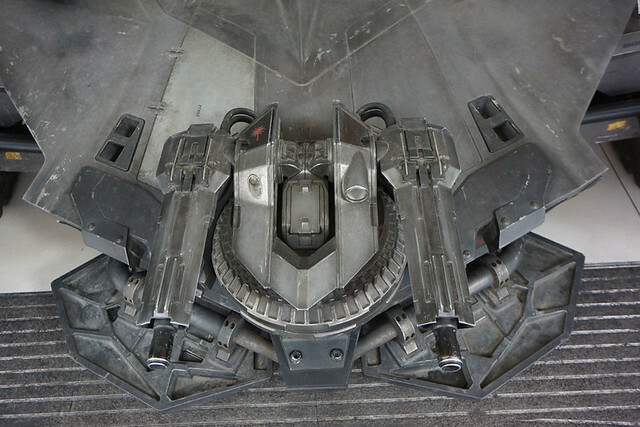 I wouldn't be surprised if the rear roof area of the cockpit doesn't retract to reveal a cannon that fires a number of different bat rounds or some other functionality that will have a unique place in the new Batman mythos. Not to drone on but I get the feeling that there are still a couple of surprises that have not been revealed as yet. 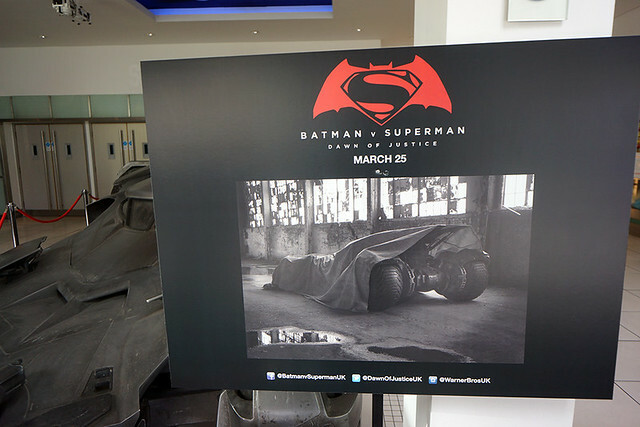 - It was confirmed whilst I was there that Batman's vehicle is indeed called The Batmobile or just Batmobile. So no specific project name like Nolan's Tumbler. 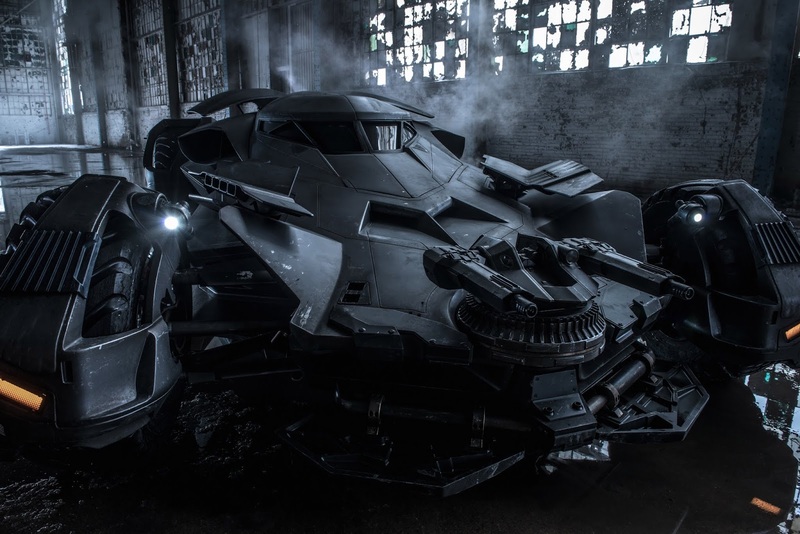 - Surprisingly for Batman v Superman: Dawn of Justice there is only one are two Batmobiles. - I was told that the Batmobile cockpit had two SUICIDE seats or was that supposed to be suicide doors? in it. - The Batmobile had been brought over by Turkish Airlines Cargo, Official Transport Partner of Batman v Superman. To ensure safe passage from the US the giant back wheels were removed and packed separately whilst the front wheels were placed on the rear axle. 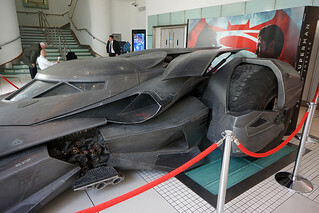 I was pleasantly surprised that the Batmobile had arrived in the UK and initially assumed it must be leading into the promotional phase of Batman v Superman: Dawn of Justice and that it was probably here for the UK premiere and then it would be shipped around with the film to each premiere destination – but a couple of days later it was announced that The Justice League Part One will be filming at Warner Bros. Leavesden Studios (home of the Harry Potter Tour) here in the UK. So it could mean that the Batmobile is actually over here for its part in The Justice League Part One. Zack Snyder’s Justice League — Part 1 is officially a go at Warner Bros. and will begin filming on April 11, a little over two weeks after the release of Batman v. Superman: Dawn of Justice, the director and studio tell EW. Just to close this post I thought I would clarify a little confusion that seems to have developed online regarding a mystery woman in the picture Zack Snyder tweeted from Leavesden Studios a little while back with Jason Momoa who plays Aquaman. The concept art behind the duo of the woman in the mid/lower left of the picture is quite clearly - the orange haired Meru - the wife of Aquaman in the comics.